Posted on January 26, 2013 by Eric Bonnici wrote in Burgers, Featured Kingsville Restaurants, Fish and Chips, Kingsville Restaurants, Pubs, Subs and Sandwiches. It has 3 Comments. The Main Grill and Ale House is a charming restaurant in Kingsville where fresh tasty food served by friendly staff can be enjoyed in a relaxing atmosphere. Both the lounge and main dining areas are characterized by exposed brick walls and plank hardwood floors in this Victorian era building. The food is carefully prepared using mainly locally and regionally produced ingredients delighting taste buds with flavour, zest, and freshness. The lunch menu has a selection of items such as salads, sandwiches, soups, burgers, and perch that deliver great value for the price. The dinner menu has a wider selection of wholesome meals that builds on the delicious lunch menu. The main dishes include mouth watering items like AAA Canadian strip loin steaks, blackened salmon or yellow perch, pesto chicken, and roasted garlic and bacon gnocchi to name a few. A savory seasonal menu is available too. The Gathering Room located on the second level is available for private functions and can accommodate 30 people for casual drinks and platter services. For full service events up to 20 guests can be accommodated. This relaxing fine casual restaurant in Kingsville,Ontario is known for great food, friendly small town service, and a perfect place for relaxing with family or friends. 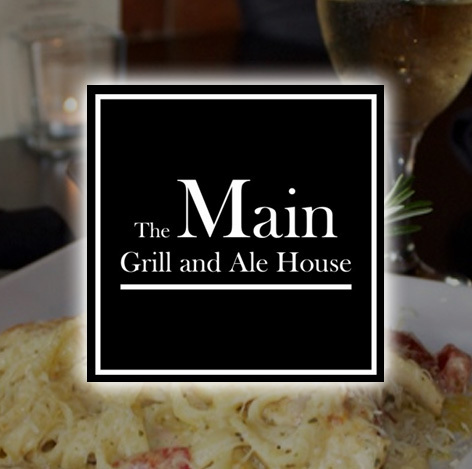 The Main Grill and Ale House will welcome you and feed you like family. I did not enjoy the lunch at The Main at all! It was band, boring and overpriced for lunch! We will not go back! Had a awesome perch lunch with my beautiful wife Friday. The food , service and company was great. We will be back. Glad to hear Bruce. We’ve heard a lot of good things about the Main Grill and plan to try it out on one of our visits to Kingsville.